OK, I’m a guy, so I love my truck. But THIS truck really is special. The Avalanche is one of the few concept cars that actually made it into production. 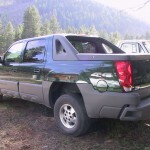 It’s completely flexible, converting from a four-door vehicle with an enclosed cargo space to a standard pickup. The back seat folds down, turning it into a little mini-camper, and there’s a tent that sets up in the back to turn it into a full-size camper. I also added a few features myself: AC power, an electric tailgate that opens and closes by remote control, televised color night-vision rear viewing, and it’s a mobile WiFi hotspot, so I leak Internet everywhere I go. What’s not to love? The primary driver of reforms that wouldn’t have otherwise happened is unauthorized disclosures.